We at Fresh Ink love doing all we can to celebrate not only our brides wedding day, but the entire planning process as well. One of the ways we do that is by our monthly roundtables with local experts where we discuss wedding related topics to answer questions give helpful insight. 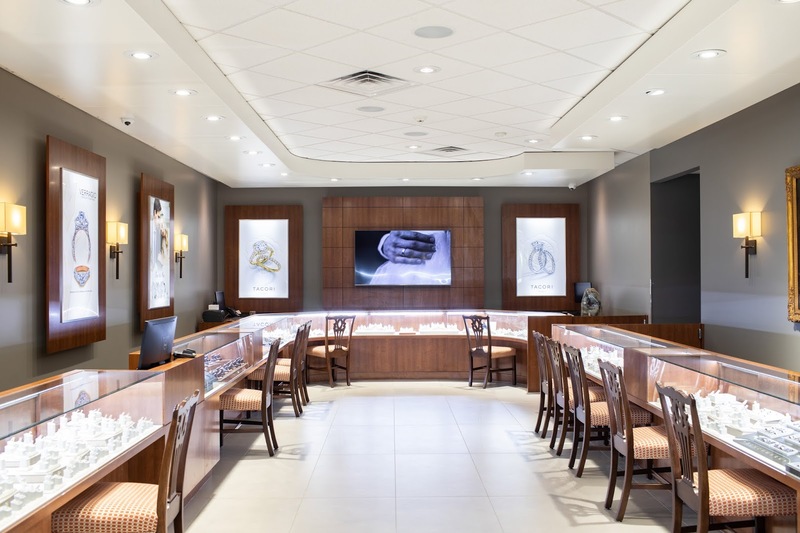 During our most recent roundtable, we sat down with Cameron Albriton and Lauren Fordice at the new state of the art Albriton's Jewelry location to talk about what it's like to find the perfect fit for your style and budget when shopping for an engagement ring. Elizabeth: Welcome! We're going to get started and introduce our round table crew tonight. You know the Fresh Ink people but I'm going to let our Albriton's friends introduce and welcome us to their new spot. Cameron A.: Hey guys I'm Cameron Albriton. I'm president here at Albriton's Jewelry. Got our lovely associate, Lauren Fordice, here. Knows her stuff so she's the correct person to come talk to if you need any help with rings or of course, any jewelry related item. Elizabeth: We're here in their new building which, we did a little tour of a few weeks ago but it is gorgeous. Everything sparkles, everywhere you turn there are 100,000 things to chose from. You have to come by and see it. It's a stone's throw from where y'all used to be. Elizabeth: It's very close by. We're going to hop into some of our questions just to kind of get things rolling. At the end we're going to give you some really close up, fabulous views of some rings that we thought were lovely. Elizabeth: This, I'm so excited about. This is so fascinating to me, this part of the couples journey. We talk about this all the time how, people call us before they come look at invitations and they were like "Well, y'all helped me with my invitations and could you help my friend? She's coming in, I'm going to tell her that she's on the way." It's something that people are so nervous about. It's the first time they've done it, they don't know what they're doing. Just kind of have them feel like they know y'all a little bit, or us a little bit in our arena, just makes people so much more comfortable. I think that's a great way to kind of say that we do things similarly. Elizabeth: Some of our questions just to get us started were, one thing we talked about initially, when we were brainstorming kind of some things like this were, how is a local jewelry store different than a chain? What are some of the benefits of working with somebody local whether it's short term or long term? What are some of the differences in local businesses or chains. Cameron A.: I can help you out with that. There's a lot of differences. First thing, a local business is going to be able to cater what they offer to their clients a lot better than a chain will. Chains typically do a lot of market research, which is great. The problem with that is they tend to kind of streamline all of their stores. Everything that they offer, if you go into one for instance, say Kay Jewelers, or someone like that, you're going to go to another one and you're going to see pretty much the same stuff store to store. Cameron A.: Another thing about locals versus chains, I would say, is locals typically are going to have a little bit more educated people that work for the business. They typically last longer within a local store because they actually have more of a relationship with the ownership. Owners are typically more involved, obviously, in local stores than they would be in chains. You typically have less employee turnover in local stores than you do chains. I would say that's one of the aspects. You're going to see the same friendly faces every time you come into Albriton's whereas certain chain stores, it could be a different person every time you walk in there. It's hard to establish a relationship with a chain store I would say, as comparing to a local store. Lauren Fordice: A lot of times too, if I know that I've been working with a customer and I'm not going to be here, I've informed one of my other colleagues. They know so that I can tell my customer "I'm not going to be here but you can come and ask for Lauren, Stewart and anyone can help you." Lauren Fordice: I try to make sure they're always taken care of. Elizabeth: Not only if you're engagement ring shopping but it's, whatever you're purchasing, it's intimidating to come in and to just have somebody that you know is kind of experienced talking about rings and your don't even know where to begin- especially when you've only been shopping online before then. Bethany: With online in general, the market changes so much with things online but you could tell that it's probably more heavily about marketing and more about technology in that field. Same with wedding invitations in our field as well. It's like, we're going to walk you, step by step, line by line. Same way with this. Educate you on what you're about to spend a lot of money on. Cameron A.: It's a big thing. We are not just selling pretty small rings. A lot of the items we're selling are quite expensive. Most folks are, as you can say, it can be intimidating to come into a jewelry store because number one, a lot of times, especially with guys, they don't know a whole lot about what they're about to come and buy, kind of what their girlfriend or someone has kind of pointed in their direction. It's a lot of money. For guys it can be stressful because they're saying to themselves, "I'm about to spend a lot of money on this, I don't even know if this is exactly what she wants. If I present this to her ..." Guys want the reaction from their girlfriend or significant other. When they don't get it and they spent all that kind of money, that's another nerve-racking thing I think a lot of guys feel when they come in here. We try to make it as comfortable as possible for them when they come by. Lauren Fordice: A lot of times they act really shy. The girl's always like "Tell them." Elizabeth: Do they ever just say "I'm just looking?" Cameron A.: All the time. All the time. Bethany: like you'll say "Is there any particular thing this is for?" Elizabeth: And it's better for them to just come on out with it. Cameron A.: Yeah, just come on out. Elizabeth: "I am looking for an engagement ring." Cameron A.: Don't be bashful is what I would say. We're very friendly. No matter what your budget is, we're happy to work with you. That's one thing about us. I've heard in the past that we've got a little bit of a reputation for being an expensive store, something like that. Yes we do have some very expensive items but we can tailor your item to really whatever your budget is. That's one thing we do a really good job of. I don't know if everybody does that. I've sold a $500 engagement ring and I've sold a $40,000 engagement ring. Either way, we can make it work and handle it for you. Lauren Fordice: We're going to try and help you out too and work with you on all different ranges of what you're needing and everything. I've always felt proud of how we can handle a lot of different ranges. Elizabeth: So, as a segway into that, we get this phone call a lot at Fresh Ink. "Fresh Ink, this is Elizabeth, can I help you?" "I just wanted to find out about what wedding invitations cost? What do invitations cost just like about?" We're like, oh my gosh it's like such a loaded question. We've gotten to where when we are initially meeting with people is, we tell them kind of just some budget categories. We'll say "Would you be more comfortable in the two to $4 a piece range? This range or this range?" What they don't know is that a lot times they can get something that looks very expensive, maybe they like typography or something about an invitation that doesn't have to be printed in the most experience way. Maybe it's kind of the same with a ring. What do you find when people come in. 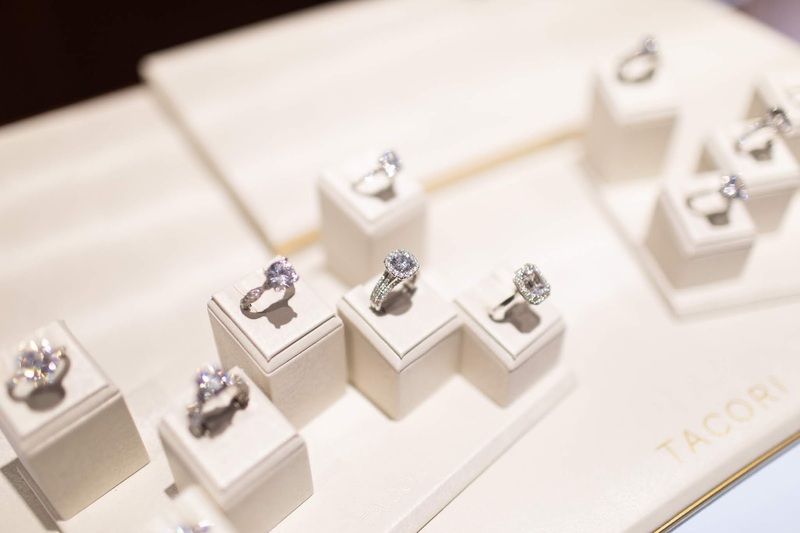 I know you've got the inevitable question, what do engagement rings cost? How do you even tell people brackets? What do you see in our market? Cameron A.: I would say, we do get the question, number one. It's usually someone who hasn't done much research, which is the vast majority of guys that come here haven't done too much research. Some have done more than others. Most people have no idea though. A lot of times they just come and say "What does a one carat diamond ring cost?" That could be all over the board. We kind of try to do the same thing. We say "Listen, what are you looking for? A one carat ring, do you want a solitaire, do you want something that's a little bit more dressed up, a little more detailed?" Sometimes they know what they're looking for. Other times, "I don't know, geez, I don't know I need to ask her." Cameron A.: Once we kind of get a ballpark on where they want to be, we can give them ranges essentially. Telling them "Hey, this will give you a nice quality stone. You're not going to see anything with the naked eye. No [inaudible 00:08:17] color to the stone, it's going to look nice in the light," things like that. We try to give them a range and say "Listen, if you come in and sit down we can actually explain, show, you the difference versus just saying this stone is going to cost $2,000 more than this one." It doesn't mean much until you actually can lay eyes on the piece. That's way we kind of handle that when customers come in asking "And what's this going to cost me. Elizabeth: Can you tell us some numbers. I'm just trying to ask what I think people want to know. Cameron A.: Sure. Engagement rings are going ... again like I said, they could be all over the board. I would say, let's put this way, one of the chains that we are familiar with, they do a lot of market research. One of the things they discovered was the average engagement ring, usually it's between three and $5,000. For us, we're a little bit higher in the store. I would say our average is probably higher than that. Probably somewhere in the five to 10 range, is probably what we average on our engagement ring sales. It doesn't mean that we certainly couldn't service somebody in that price range. That's kind of what I would say. I'd say you've got ballpark ranges anywhere from the low thousands, kind of coming into it. You want to spent probably 2,000, $3,000 in order to get something that's going to give you a decent look. Cameron A.: I told you earlier that I sold a $500 engagement ring. There's not a whole lot to that. Stone just is solitaire, small diamond on top and that's kind of where we are. You want to come into it with a couple of thousand dollars will give you some options. If you came in with under that you're going to be limited and we can supply you obviously. Come in expecting you're going to get a really detailed setting in that price range is going to be difficult to achieve. A lot of the setting themselves, detailed look, are going to run starting $1,000 bucks and up from there. Cameron: You know it's probably just a solitaire, small diamond on top and that's kind of where we are. So you want to come into with, a couple thousand dollars will give you some options. If you came in with under that, you're going to be limited. And we can supply you, obviously, but coming in expecting you're going to get a really detailed setting, in that price range it's going to be difficult to achieve. You know, a lot of the settings, themselves and the detail look, are going to run starting at a thousand bucks and up from there. And so, you got to factor in some budget for your diamond as well. And so that's important. Bethany: Oh, about expectations, we were talking about that before at a round table. It's like if you have, you know, depending on your price range you have to also adjust your expectations accordingly, so. Elizabeth: Well, just a quick pause as we get set in our discussion if you have any questions we would love any questions that you have because we got a few more, but I'm sure there's some that you would like to know. Elizabeth: And if you're, you know, in a serious dating situation with someone and you've always been embarrassed to like prance in here and ask Lauren a question... now you can just tell us on Instagram and we will ask it for you. Lydia : We've had a couple people comment. Sara Gatlin asked, "Do you all see a lot of people coming to get gemstone rings for engagements instead of diamonds?" Behtany: Great question. Terrific question. Elizabeth: I can totally see Sarah doing a colored center stone. Cameron: ... we definitely do that. That's definitely something that popular these days. And you got something? Bethany: I heard, well I was going to say, I heard, I didn't know this, I mean, I don't know anything about rings but like the reason diamonds and whatever materials were used most prominently is because their everyday rings, they have to be tough, and not every gemstone is like tough enough. Lauren: Know how to take care of it. Cameron: Yeah. They're going to abrade. They're going to scratch. And you may in time have to have those re-polished or replace the stone all together, if you choose. But that's something to keep in mind if you do go with a colored stone ring. Elizabeth: Especially since Catherine of England has like the Princess Diana one with the sapphire in the middle. Cameron: Yeah, Princess Diana has the big, or had the big ol' sapphire diamond ring and it's beautiful for sure. Elizabeth: Okay, great. Okay, I got a few more and then I'm going to segue into a couple of questions. We'll get close up and let you look at some of these. But, you know, this goes to what we were talking about. What would you say is the smoothest, you know, procedure for somebody that's coming to look. Whether like bringing in their fiance or what would be the per- ... If you could anybody advice on how to go about starting to look, what would you tell them? Lauren: ... or you know, to make the next step. And we can then kind of start talking budget. But at least we know like the girl's style which is very important. Elizabeth: She probably has seen a lot on the internet or whatever but maybe not in person. Lauren: Sometime it's totally different. You might like something on Pinterest or whatever but when you put it on, it's totally different, so. Cameron: Yeah. Yeah, I agree with that. Lauren: It's good to try on. Cameron: Yeah, it's definitely good to try on. A lot of ladies these days have Pinterest boards and stuff like that where they found a lot of rings and styles they see, they've like online. 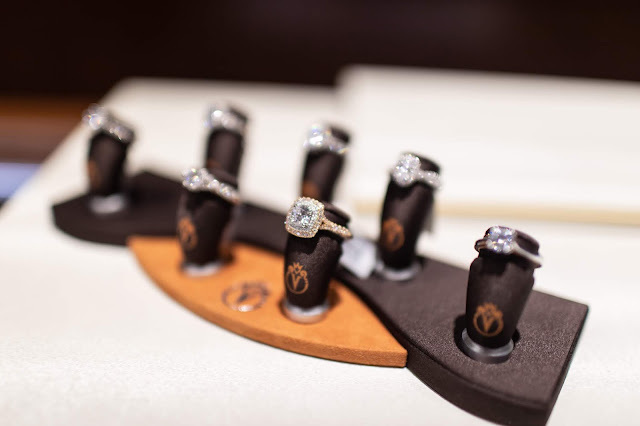 And when they get in the store sometimes the reaction is not what they thought they would be when they'd actually try a ring that's like that on or see the ring in person. So, it's really important to get in here, but I'd reiterate what she said, what Lauren said. A lot of times it's nice for the couple to come in together these days, get a feel for what she likes because there are so many styles and options out there these days. Usually, unless the couple has already discussed budget, which sometimes they have, and sometimes they haven't. The first meeting, yeah, we're just looking at: all right what shape center stone do you like, what style of ring do you like? Lauren: Yeah, we need that. Cameron: For sure. For sure, got to have the ring size. Because you'd be surprised how many times we'll get down to it, the guy be ready to go, you're like, "Okay, let's order this." And we'll go, "What's the finger size?" And he'll say, "I've no clue." Lauren: We're like, "You need to get a ring out of her jewelry box and bring it. Elizabeth: Yeah, I saw that somewhere when I was like just looking for some questions, it was like, "Borrow one that she won't know is missing and get it sized." Cameron: That's one of the hardest parts probably for guys, especially if they're trying to be discrete and kind of more of a surprise. Cameron: Just so a little bit because a lot of these designs settings or detail settings can only be sized so much from where they start. And so, that's one thing we always want to try to get as close as we possible can on figure size for her. So if we do special order the ring and maybe we're off a half size, that's not a big deal to size. It's when we're off by two sizes, a size and a half, when things become a problem. And so that's one thing that we always like to do, if the guy ... Usually the guy and girl discuss getting married before he comes in and buys the ring at least a little bit. Lauren: He's usually mentioned it or she's showed him her Pinterest. Elizabeth: I can see a guy trying to navigate through Pinterest. Really it's only a screenshot of a Pinterest. Cameron: Exactly. But it's, you know, that's why it's nice sometimes to have them bring the girl in too. Because we'll take notes on what they've looked at. And if he says, "Hey man, I see this Pinterest page." And we're seeing a ring that's similar to this one that we saw on store over and over again. Well, hey that's a pretty good pattern right there. It's probably a good sign that she really likes that ring right there, or that style. Jill Gunn: Excuse me, do you all take appointments? Cameron: We do take appointments. Absolutely. So, that's one thing if for instance you want to sit down with either myself or Lauren or anyone in particular. We definitely take appointments. Just reach out to us. You can email, call. We'll give you a wide open time frame of when we're available to meet with you guys. And like I said, we've done, I've met before opening hours and after closing hours with people before. So, we're very flexible as far as if someone really wants to be discrete. Lauren: Yeah. We've like shut people in the office before. Closed the doors. Elizabeth: ... 10 years ago. Elizabeth: And she said, "Then there's another couple that's there for the same wedding in the back of the store doing the same thing." And they're like, "Don't tell anybody we were in here." Cameron: We have that all the time. I had one customer one time, where the old store, the layout was not very private. Lauren: That's why we have all this in the back. Cameron: Our bridal layout is in the back of the store now. So, if you're actually are coming into the shop and want to be discrete the odds are the person coming in to pick up their watch repair is not going to see you around this corner, unless we're cutting up and having a big time. Cameron: A lot of ladies want a little bit of extra something, usually, when they come in, than just a solitaire. But one thing that's nice about solitaires is you're able to ... Say, for instance, we get a lot of guys and ladies who are in med school. Their future is bright, but they're not making a whole lot of money right now. So they're wanting to get engaged, things like that, and so the way they're able to maximize the look of their ring is to say, "I'm choosing a solitaire right now, get the biggest, nicest diamond I can in my price range," and then coming back in a few years, letting her pick out a setting maybe for an anniversary or something like that and upgrading to maybe a little fancier setting or doing the nice big diamond band or something to kind of dress it up a little bit. So we have that too, so there's a little bit of that. But I would say probably in general we sell more detailed, kind of ornate rings than we do just straight solitaires. But again, we do sell a lot of straight solitaires too. Jill: Yeah. Well, and this is one thing I skipped over, but you see online people talking about financing and stuff, is that something y'all have a partner for, or any options? Cameron: Yeah. Yeah, we offer financing through a third party. We're able to offer up to 12 months interest-free. Now, that's interest-free as long as you make your payments on time, and as long as you pay it off during the time frame that you establish. But it is interest-free, as long as you follow those parameters. And we also offer layaway as well. So if, say, you've got an anniversary coming up in three months, but your wife's come in, she's established a wish list here with us, which is a great idea, by the way. Elizabeth: It is. Jill, you could do that before we leave. Cameron: Yes. Please do. And the guys love it too, it makes it so much easier for them when they come in here. Because once you get past the basics, guys are kind of lost in here anyway. They're like, "I don't know what fashion pieces ..."
Elizabeth: Well, it's all gorgeous, I mean, how would you pick? Cameron: Well, thank you. It is difficult. There's a lot of pieces here, so it's really, really hard. But that's what I would say. Elizabeth: So there are options for people. Speaker 1: There are options, yes. And again, the layaway. Layaway is what I was getting at there. If you have a few months that you, maybe the occasion is three months out. Come in and pick out the piece, make a payment every month and knock it out over three months, rather than having to pay all at one time when you come in to pick it up that month. Sometimes it's a little bit easier for people to kind of step into those pieces rather than just pouring all their savings into the piece and not having a whole lot of emergency fund left. 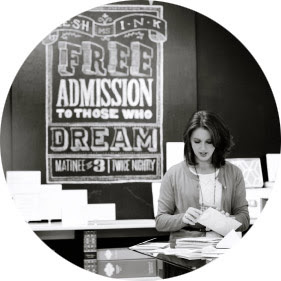 © Fresh Ink : Style Sentiment & Stationery in the South | All rights reserved.